How Peter Mižigar found the Sabbath in Slovakia. The 2,000 inhabitants of a Roma settlement in Slovakia considered themselves Christian. But none attended church. None had ever read the Bible. After Slovakia’s independence in 1993, various missionaries started coming to the Rakúsy settlement. The first, a married couple, preached on the main street every Sunday. People gathered to listen but understood little because they had never read the Bible. One villager, Peter Mižigar, was more interested in performing in his band than listening to the preaching. He played bass guitar at weddings, funerals, and other events. Usually, the band members, including his younger brother Pavol, spent the band’s earnings on alcohol. But Peter never drank while performing. He was the designated driver. While performing sober, it struck him that every audience consisted of two groups: one with good manners and high intelligence, and the other with a more primitive attitude. The other band members didn’t notice because they played and drank. Peter watched with fascination as the evening wore on at every concert. The distinctions between the two groups of Roma disappeared as they drank. When people were drunk, the rich ones stripped to the waist and behaved the same as those who were poor. Every event also tended to end in a drunken fistfight, even the funerals. When the audience turned on the musicians in a drunken frenzy at an event in the Czech Republic, Peter decided that he had had enough. His brother agreed. Pavol had been listening to Christian music shared by visiting missionaries. Soon, Peter, Pavol, and the other band members were playing Christian music at Pavol’s house. During one session, Peter noticed a Bible lying on the table. “What kind of book is this?” he asked, picking it up. Pavol was studying the Bible and didn’t want to share it. While Pavol and the others were playing, Peter slipped the Bible under an arm, covered it with his hands, and left the house. Back at home, he read the Bible for the next month, going through Revelation and then the gospels. After a while, he admitted to his brother that he had taken the Bible. As the younger brother, Pavol could only ask that Peter return the Bible once he finished reading it. One day, Peter came across Mark 16:16, where Jesus said, “He who believes and is baptized will be saved” (NKJV). He closed the Bible and opened it. The same verse stared back at him. “He who believes and is baptized will be saved.” Three times Peter closed and opened the Bible, and every time he opened to the same verse. Peter grabbed the Bible and ran to his brother’s house. Pavol was jamming with two friends. “Please come and baptize me,” Peter said. He didn’t know anything about baptism. he just wanted to obey Jesus and be baptized. “You want me to baptize you?” Pavol said. “Yes, it is written here clearly that whoever is baptized will be saved,” Peter replied. Pavol was hesitant, but Peter was adamant about his decision. The two brothers and their two friends waded into a three-foot (one-meter) deep brook outside the settlement. All four friends were baptized that day. They confessed their sins to God and sought forgiveness. Afterward, they experienced a tremendous joy and spoke about all of heaven rejoicing about their baptism. They even perceived the nature around them from a different perspective. Somehow for the first time in their lives they appreciated the birds chirping and the sun shining. After that day, the four men stopped cursing, smoking, and drinking. Neighbors were astonished and wondered what had happened. Before, when the men had drunk, people had fled in fear. The four friends decided to study the Bible together daily. Sometimes they started in the evening and read until 9 a.m., talking about God and looking for answers in the Bible. Then another missionary, Maros, a Roma, showed up in the settlement. He heard about the Bible group and invited Peter and his friends to join his charismatic church. The group went but were terrified when they saw church members speaking in tongues. The Bible group continued to meet, now in Peter’s home, and other people joined them. Often 50 to 100 people were packed in Peter’s combined living room and kitchen. After most people left in the evening, a group of men studied late into the night. During one of those late-night sessions, Peter’s attention was drawn to Mark 16:9, which begins, “Now when He rose on the first day of the week.” He remembered that Jesus and his followers had rested on the seventh day, Saturday, and wondered why all of the visiting missionaries worshipped on Sunday. Maros wasn’t able to answer the question when Peter and other people asked. The Bible study group kept on reading and found the fourth commandment. They began to keep the Sabbath. One day, Peter mentioned his perplexity about Sunday to a man who was visiting a relative. The man, Josif, happened to be a Seventh-day Adventist, and he told Peter that there is a church that keeps the biblical Sabbath. At Peter’s invitation, Josif spoke to the Bible group. Later Josif took Peter and his friends to visit Adventist churches in the area. Peter announced to the Bible group that the churches did not hold loud, chaotic meetings like the charismatic church. He was impressed with the quiet reverence of an Adventist communion service. Peter’s living room became an Adventist house church with Sabbath worship services and other programs. Peter, his brother, and 24 other members of the Bible group were baptized into the Adventist Church in 2015. Ten more people were baptized over the next two years. 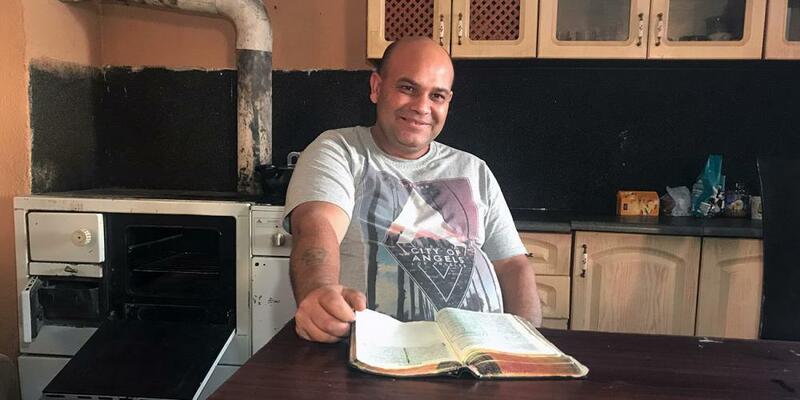 In 2018, an Adventist church was constructed on the outskirts of the settlement, and it is packed with about 100 people every Sabbath. This is the church that God built from scratch in Peter’s living room. Part of the Thirteenth Sabbath Offering in first quarter 2020 will help fund programs for vulnerable children at the church in Rakúsy, Slovakia. Global Youth Day | Part 2 Global Youth Day is a day where young people miss one sermon to become the sermon. Let's see how youth around the world are becoming the sermon!